Beginners are clueless on how they need to start guitar lessons. They are equally unsure what kind of gear they need for a certain price range. A guitar is comprised of a body (large rounded portion), a neck (long thin segment), and headstock (tuners with the strings swirled around them for adjustment). You need to get a guitar with the basics only and make your way up from there; no fancy accessories. In the 200-dollar range, you may not find outstanding guitar selections but there are a good number of quality pieces that let you get started. This way, even if you lose interest, you did not waste a small fortune. Then again, if you find that you are growing interested in guitar music you can upgrade to a better piece later. Don’t be surprised if you find these guitars looking stylish and professional. Several musicians are known to return to these guitars to practice a few notes and see how they sound on a device they may have originally used back when they were ‘not so famous’. This is actually a technical advantage, because simple guitars can produce a markedly different sound sometimes due to them not having too many options to toggle, tune and tweak. 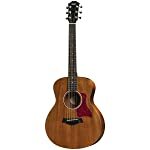 Check out our top 5 best acoustic guitars for beginners under $200. Some of them are package deals containing all you need in a beginner-friendly set. Choose from three different body types (mahogany, nato, and rosewood). Our review focuses on a single guitar; no accessories. 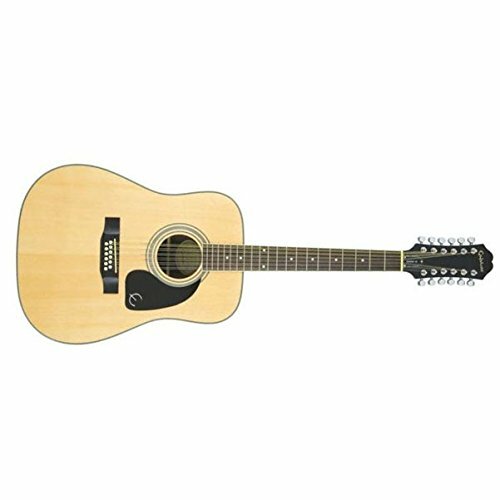 Yamaha FG700S is one of the best acoustic guitars for beginners under $200. The natural high-gloss finish makes this guitar a classic beauty. Essentially a 6-string guitar, it is ideal for beginners. A good tortoise pickguard and black-and-white body binding with accents makes this guitar gorgeous. You also get reliable die-cast tuners and an excellent rosewood fingerboard. The fact that it is a spruce top (solid sitka) adds to the long-term value. 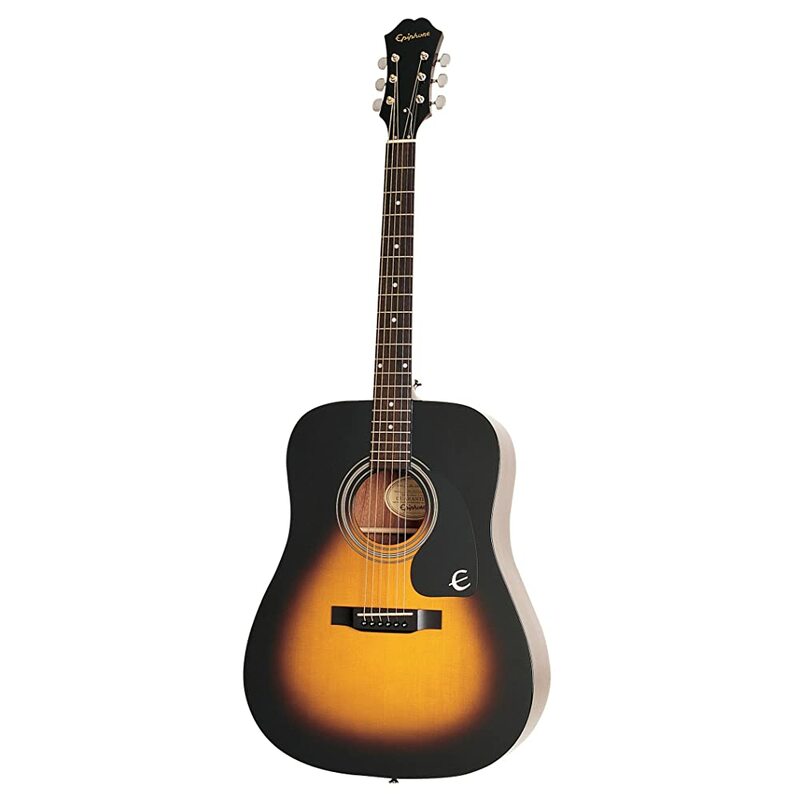 Our review deals with the guitar alone, which is sold in three distinct colors (ebony, natural, and vintage sunburst). From a mahogany body to a spruce top, Epiphone DR-100 has a 14-degree headstock that provides ideal pressure at the nut. A rosewood fingerboard adds to look and reliability; especially while tuning and playing for beginners. The 25.5-inch scale rounds off the Epiphone’s allure. From an iconic look to a beautiful long-term design, the DR-100 is a keeper. Our review deals with the Gigmaker Deluxe edition, not the standard. You get a DVD to help you visually see all the common strings on the guitar that comes with the package, and how to change, pick, and tune said strings. The tuner, Qwik Tune QT-11, comes with pitch-pipe design. 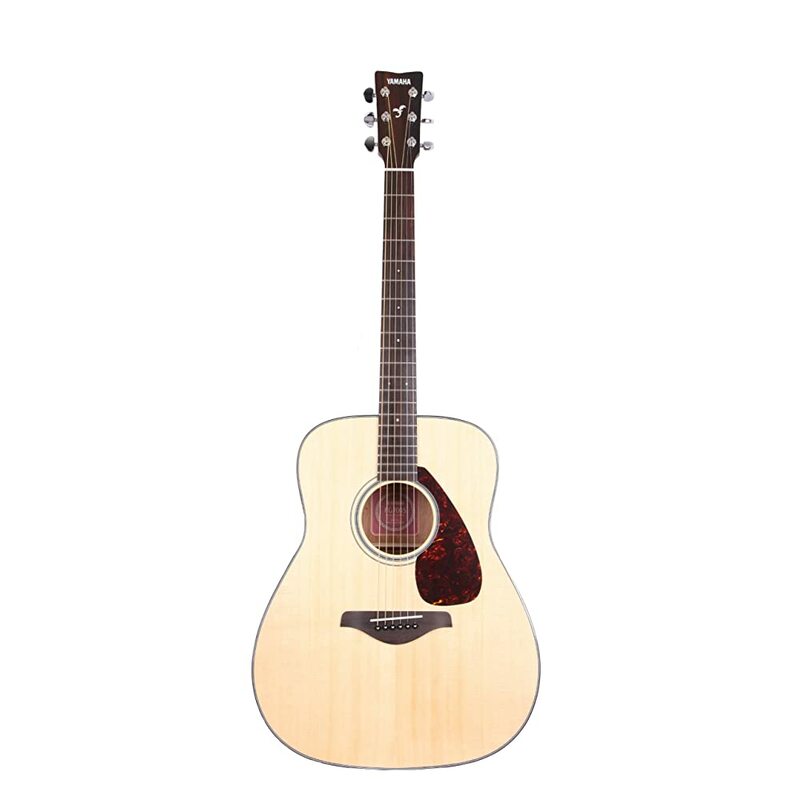 A full-size FD01S acoustic guitar is the obvious addition, with nato back and sides, and a spruce top. The design is made to counter humidity and promote ideal sound transference. Accessories: bag, strap, picks, strings. 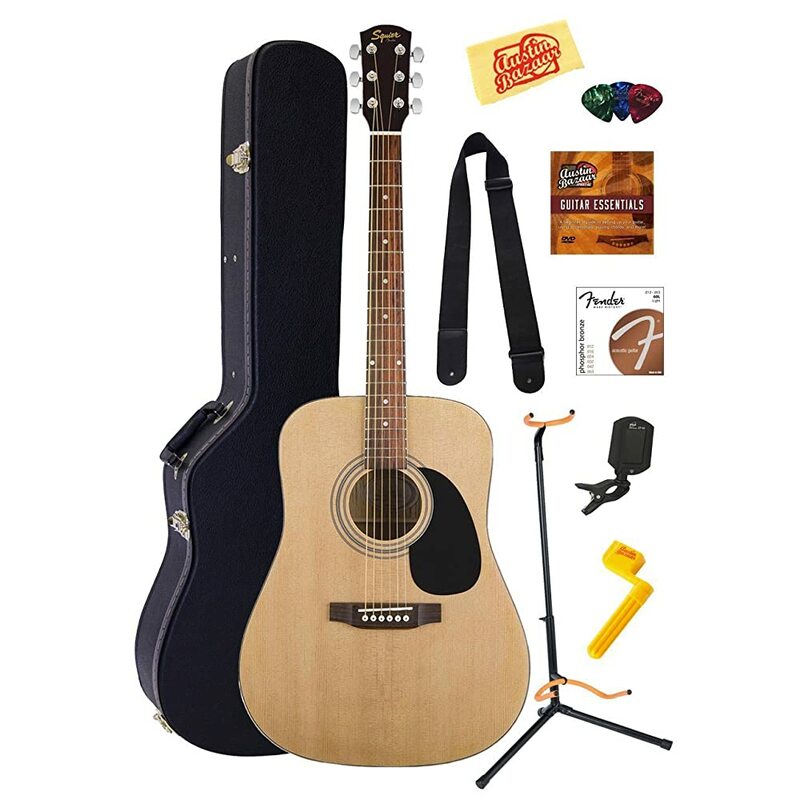 This guitar package has everything you need to start playing guitar. An all-in-one set of guitar goodness for beginners, this amazing bundle from Fender Squier is making waves. Its synthetic bone saddle is compensated to match the rosewood bridge, and gives it a streamlined look. Aside from the guitar with its dot-inlaid 20-fret rosewood fingerboard, you also get an Austin Bazaar DVD with all the instructions you need. Additionally you get a stand, clip-on tuner, polishing cloth, strings, picks, strap, string winder, and a hard-shell case from Gearlux. Aside from a limited lifetime warranty, the FA-100, the protective Nylon bag adds to its value for money. Incorporating a hex/allen truss rod wrench at the neck, the Fender Duratone strings are a work of art in their own right. The rod also ensures high playability, because it can counter string tension from the e 12-52 gauge. The quarter-sawn X bracing and a Basswood top make for excellent design sturdiness and beautiful sound projection. The body has a nice glossy finish and stays in tune. This review deals with a single guitar; no accessories. This beautiful 12-string piece brings variation and a specialized design that caters to beginners. A 25.5-inch scale makes for some variegated playing. A spruce top and mahogany body (sides, back, and neck) ensures look and longevity, especially with better sound output with age and use. Aside from amazing structural engineering strong enough to support 12 strings, this guitar also brings ace sound output. Dot-inlay graces the rosewood fretboard, and balances the sturdiness required between nut and bridge to accommodate 12 strings. Amateur guitarists need to learn from basics on up. They are not intermediate-level players, and most of them only want to try guitar music as a hobby. That said, a cheap under-200-dollar selection can bring outstanding value for money. Then there is the kiddy angle, with little children who can be introduced to guitar playing with a cheap model to see if they like to take up lessons. While most of our guitar suggestions are 6-string affairs, one of them is a 12-stringer. This last can be a little more challenging that the others; take note. With practical finish and tuning quality and a distinct appearance to inspire you, beginner guitars come packing several high-en﻿d features that you will sometimes find in costlier pieces. Your aim is to learn how to play, which makes these cheap models a dream come true for musicians on a budget. Sound quality is not affected in the least, in fact all the products we reviewed above come designed to grant ideal sound output. This sets a guitar apart, no matter its price range.